Belgian, French Fans to Take a Walk Ahead of Football Semi-Final - Consuls Gen.
ST. PETERSBURG (Sputnik) - French and Belgian football fans will take a walk around St. Petersburg to support their national teams ahead of their semi-final encounter at the World Cup, French and Belgian consuls general said on Tuesday. "A walk of the fans is organized in every city where our team plays. I encourage fans to come to the metro station by 18:30 [15:30 GMT] to start today's walk. It is a good and pleasant event," Belgian Consul General Hans Timbremont told journalists. He added that around 2,000 Belgian fans could arrive in St. Petersburg to watch the game. 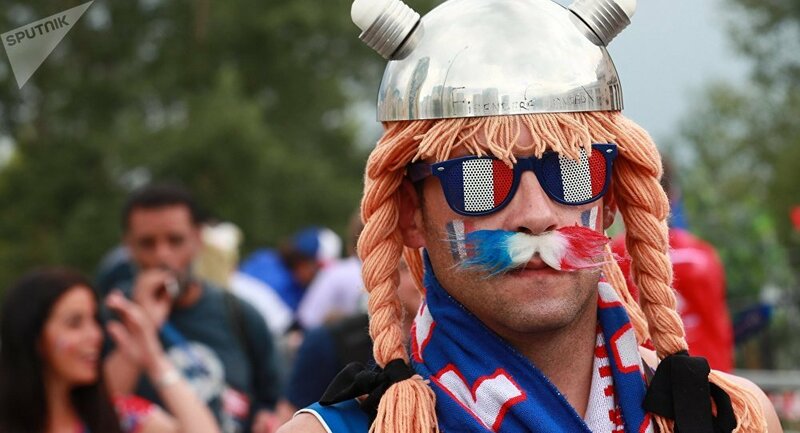 French Consul General Hugo de Chavagnac said that his compatriots would organize a walk of their own near the St. Petersburg Stadium at 19:00 (16:00 GMT), with around 3,000 French supporters expected to come to the match. Chavagnac and his Belgian colleague also praised the "wonderful atmosphere" created at this year's FIFA World Cup in Russia. "I attended the Fan Fest and saw that the atmosphere was wonderful there, all fans confirmed it. Regardless of the beauty of this sporting event itself, this World Cup was helpful in breaking the stereotypes about Russia that might exist," de Chavagnac told journalists. He added that Russia had proved that it could welcome fans from all over the world. "I saw in these recent weeks how well the Russians can receive fans of all nationalities," Belgian Consul General Timbremont said, adding that one of the main features of the 2018 World Cup was the fans' decent and respectful behavior. Belgium and France will play each other at the St. Petersburg Stadium on Tuesday, with the kick-off due at 21:00 Moscow time (18:00 GMT). French president Emmanuel Macron will arrive in Russia later on Tuesday, but his visit will be limited to attending the game. Belgium's King Philippe and Queen Mathilde will also come to the city for an unofficial visit. The 2018 FIFA World Cup kicked off on June 14 and will continue until July 15, with the final set to be held at Moscow's Luzhniki Stadium.